While the Pier Selection Committee gathers "more information" the pot boils and the plot thickens. First, with ALMA the thing out at the end is a concrete rectangular box. That's it - a box. No matter how you look at it, it is a box. Not much imagination, even if you turn it upside down its still a rectangular box. You don't have to wonder about what the designer was thinking or what motivated him - it's a box. Looking at the inverted pyramid you also have to wonder what was the designer thinking? Why a Pyramid, why upside down, why not right side up or on its side? You actually have to think and stretch your mind. When you look at ALMA from above it looks like a big Banjo. Since the push here seems to be to the millennials and as far as I can tell other than Deliverance they're not than fond of banjo music. It seems to me that promotional material for something that looks like a big Banjo may not bring the millennials in the droves anticipated by the ALMA supporters. And there is that Box thing. It's kind of like the LENS who would wear a T-shirt with that thing on it? 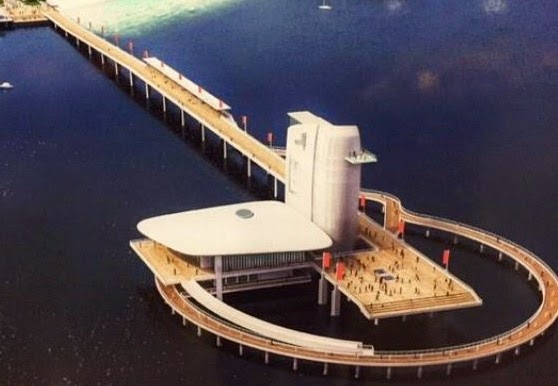 When you look at Destination St. Pete Pier from above there is an interesting approach and at the end this structure that kind of boggles the mind. What is it? I really need to see this for myself. And when you do your imagination can run wild. It will also make one really neat T-shirt. 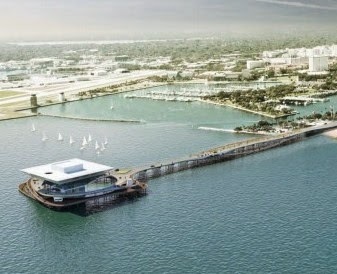 Finally I think some of the members of the Kriseman Dream Team and City staff, along with a few of the Selection Committee members have convinced themselves that the citizens of St. Pete are neither hip enough, or intelligent enough to know what works on the Pier. I believe you hold that view at your own peril. Last time around the issue of ignoring the public was almost as big as the total dislike of the LENS design. You all probably already know the definition of insanity.